It’s time to break out your slow cooker (yet again) because I have a another tasty recipe to share. It’s inspired by Baingan Bharta, one of my favorite vegetarian dishes to order when we go out for Indian food. 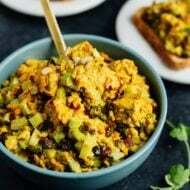 Naturally this make-at-home version involves Indian spices, but I’ve changed it up a bit by using a combo of eggplant and zucchini. And I also added coconut milk to make it extra creamy. I’m all about the coconut milk lately. After cooking for hours the eggplant and zucchini get melt-in-your-mouth tender and soak up tons of flavor from the spicy sauce. So delicious! And did I mention it’s super easy? You literally throw everything in your slow cooker, stir, cover and go about your business while the veggies cook to perfection. 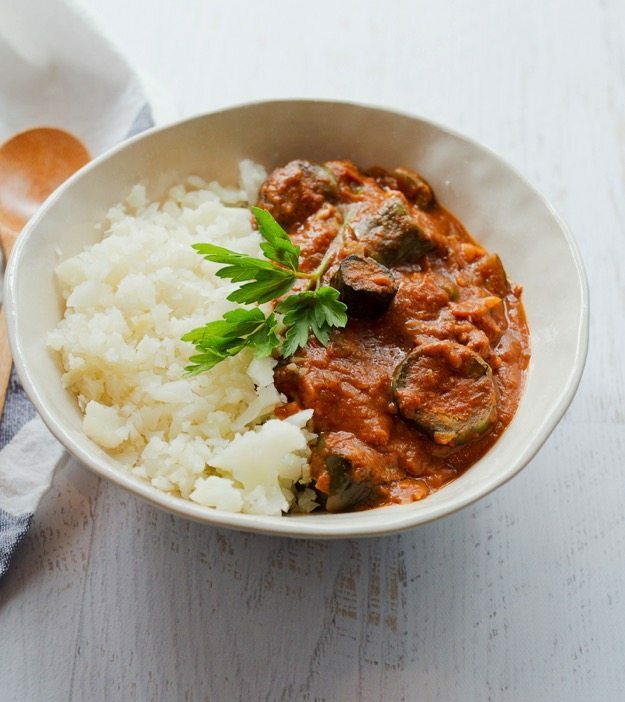 For serving I love pairing the curried eggplant with rice — I used cauliflower rice but basmati rice would work great as well. I also recommend adding in a little protein. Chickpeas would be awesome for a vegetarian meal or you can do chicken or even shrimp. 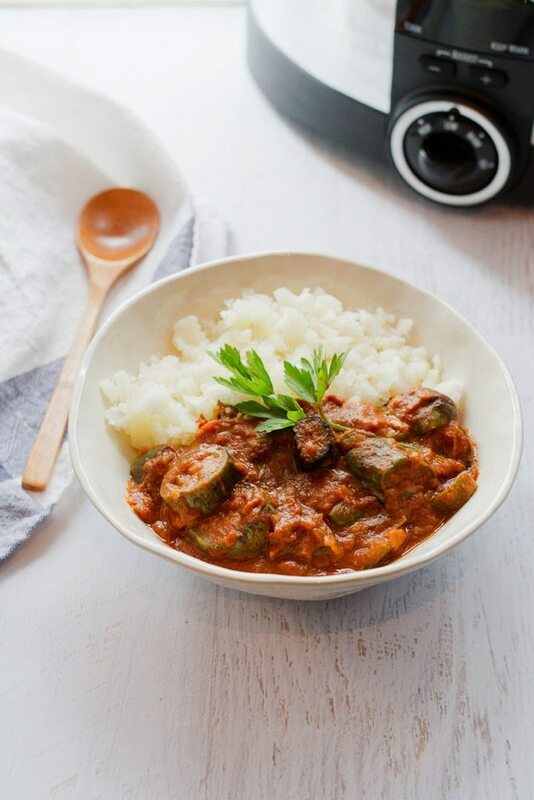 Eggplant and zucchini slow cooked in a creamy tomato sauce with Indian spices. 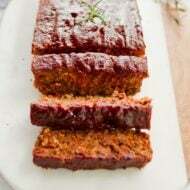 Easy, healthy, vegan and gluten-free. 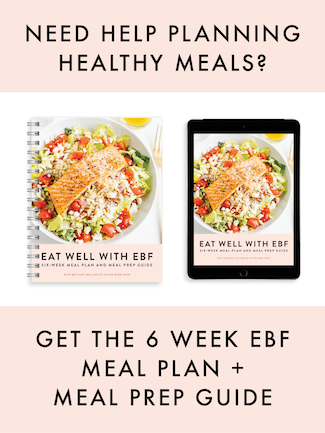 Serve with cauliflower rice for a veggie packed meal! Place onion and garlic in a food processor or chopper to finely chop. 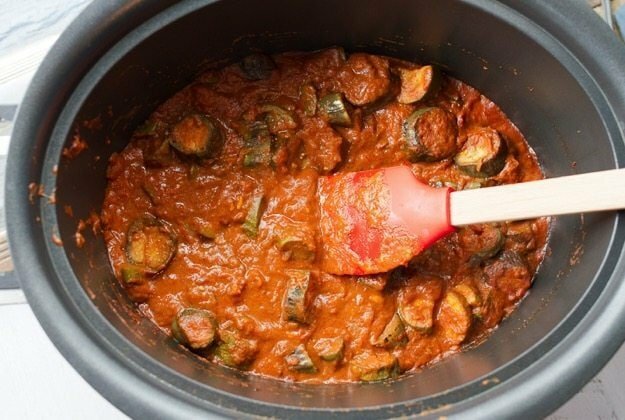 Add chopped onion and garlic mixture, eggplant, zucchini, spices, tomato paste and coconut milk to your slow cooker. Stir everything together. At this point if the mixture seems too thick you can add in a little vegetable broth. Cook on low for 4-5 hours. Garnish with fresh parsley or cilantro. Serve warm with rice and naan. Adapted from Love & Flour. I’m trying to get rid of the food in my fridge and pantry before I go home for the holidays, and I have almost a whole can of coconut milk and an eggplant. I said, what am I going to do with this? Then THIS RECIPE!! Thank you!! This looks fabulous! Perfect for chilly winter nights. I don’t have a slow cooker – do you have a sense of how long it would take for the flavors to develop well on the stove-top? LOVE your crock pot recipes! Keep them coming! 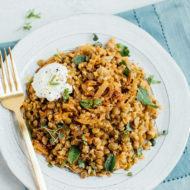 Can’t wait to try this one – I’d love to add some chicken like you suggested – do you think it would work okay to add chicken thighs in with everything in the crock pot? You can try it, but I’m not sure how it will turn out because I’ve only used coconut milk. Let me know if you try it! Aloha from Hawaii! I made this last night and it was delicious! I made my own garam marsala and added carrots. I think when I make it again I’ll use different veggies and maybe tofu. The sauce is so delicious, I think there are a lot of different veggie combinations that can be used with this. I made cauliflower rice to go with it. This is a keeper!! Thank you for a great recipe ???? Excellent dish. I made it for dinner yesterday but also added garbanzo beans. Big hit! Thank you for sharing. This was sensational. I substituted boneless chicken breast for zucchini. I did not add any broth as the chicken provided enough liquid. Will definitely make this again. Thank you so much for this recipe. It is super hot and humid here today and I have 4 eggplants ready in my garden along with about 5 zucchini so this will help use at least some of them up. My kids LOVE ‘indian food’. This sounds fantastic! I don’t have a slowcooker, any ideas on how long this would need to simmer to get all the flavours correctly on a stove top? This looks delicious. 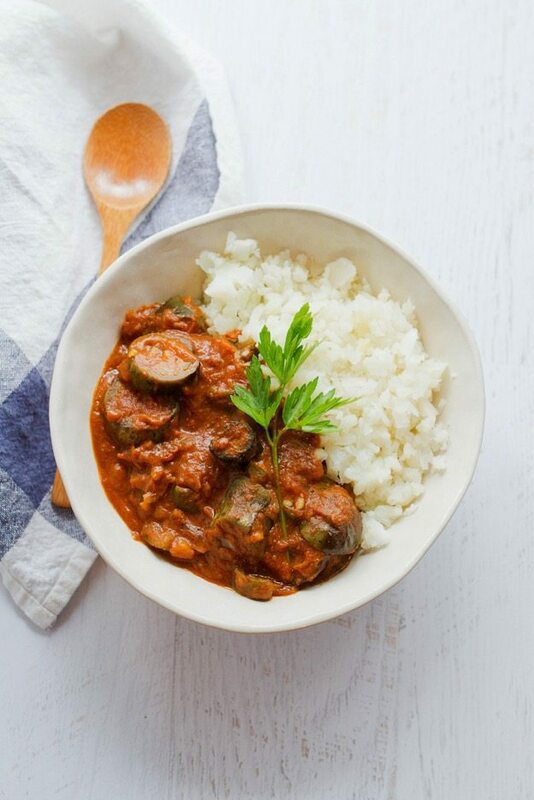 How do you prepare the eggplant before putting it in the slow cooker? Thanks! Would you add the chicken raw? Hi Justin. Yeah, I would cut back on the amount of veggies a bit (just so you have enough sauce) and add chopped raw chicken to the slow cooker. Let me know how it turns out. Going to make this but just wanted to note that it’s hard to tell you mean 1 X 6oz tomato paste and not 16oz. Hi- I was wondering if you think the slow cooker could be left on for 8-10 hours on low instead of the 4-5 hours in the recipe, or would the entire dish be too mushy? Hi Emily! I haven’t tried it, but I think doing it on low for 8-10 hours would be fine. Let me know if you try it! I tried this recipe exactly as per instructions, and after 4 hours it came out smelling awful – the coconut milk had gone rancid! I’ve made recipes before where the coconut milk goes in at the end, so I should have trusted my instincts and put it in at the end. I don’t know why this didn’t work for me but seems to have worked for others. A full pot of veggies ruined and time wasted! and sweet potato. Strongly encourage not adding coconut milk until the last hour so that it doesn’t break. I love this recipe! I had an eggplant and a yellow squash one day and found this recipe – I’ve made it five or six times. Thank you! !